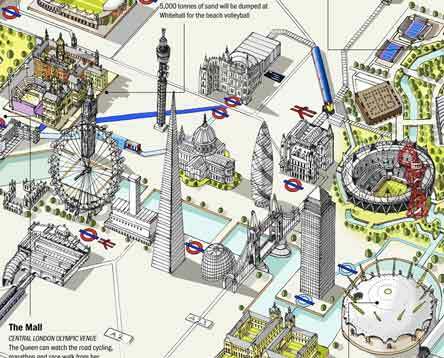 The maps feature key landmarks, the locations of Olympics related events (such as London Live) and shops, a selection of interesting museums and also more practical information such as public amenities, police stations and NHS walk in centres. The maps also include 6 discovery trails (round trips) to help explore different areas (such as the City; Spitalfields and Brick Lane; Regent’s Park; and the West End). Federal Bureau of Investigation agents have finally ditched paper files for a new computer system, an effort that took 12 years and cost more than $600 million. The system, called Sentinel, includes elements resembling Web browsers, with tabs and movable windows, and forms that are filled out in a question-and-answer format similar to consumer tax software. An FBI special agent demonstrated the system, which went live July 1, to reporters Tuesday. Agents can share files electronically and can track changes made by others. RSS feeds, commonly used in Web browsers to aggregate news topics, can be used to track updates on files. Agents can also use a search feature, entering a phone number, for instance, to see if it occurs in other active cases or leads. One of the biggest hurdles to getting agents to accept the system, Mr. Johnson said, has been their reluctance to believe it’s really happening. People are pulling the plug on cable television by the hundreds of thousands. Comcast’s Q2 2012 earnings show the cable company is relying heavily on its high-speed Internet service subscribers. Though the cable giant reports a total Q2 increase in customers of 138,000; the cable company also lost a massive 395,000 television subscribers in the last year. This number is huge, considering Credit Suisse analyst Stefan Anninger previously predicted 200,000 fewer subscribers would pay for television services this year.